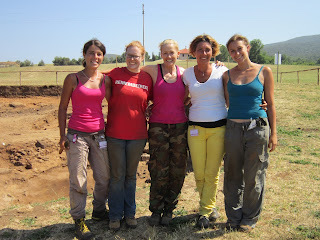 Etruscan Dig June 2012: Photos and background . . . Photos and background . . .
What an amazing experience! 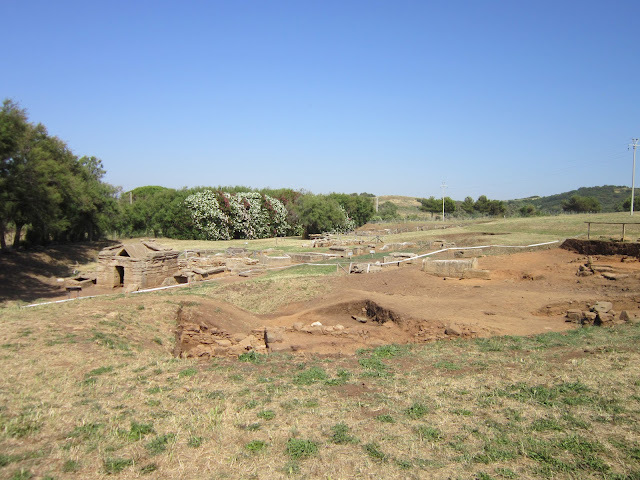 Before I post the photos, I would like to give you a little background on the dig site and the area. 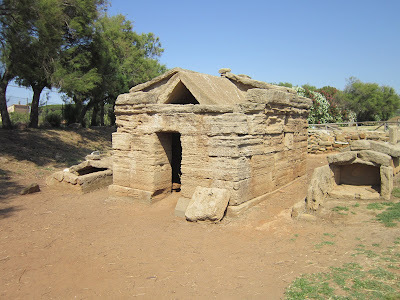 Today's town of Populonia (where we stay) is located on the western coast of Tuscany. I think that Populonia now has a population of probably about two dozen people (in 2009, the population was only 17), but the nearby seaport of Piombino is a moderatly sized town with many restaurants, bars, and other retail and from its shore - you can see the island of Elba. 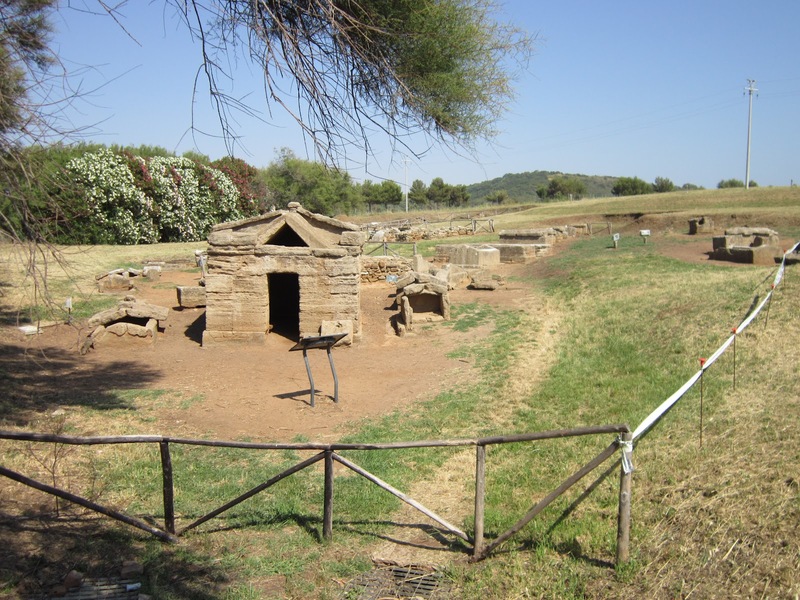 The area, rich with various metal deposits, was of particular interest to the Etruscans because of its iron ore. 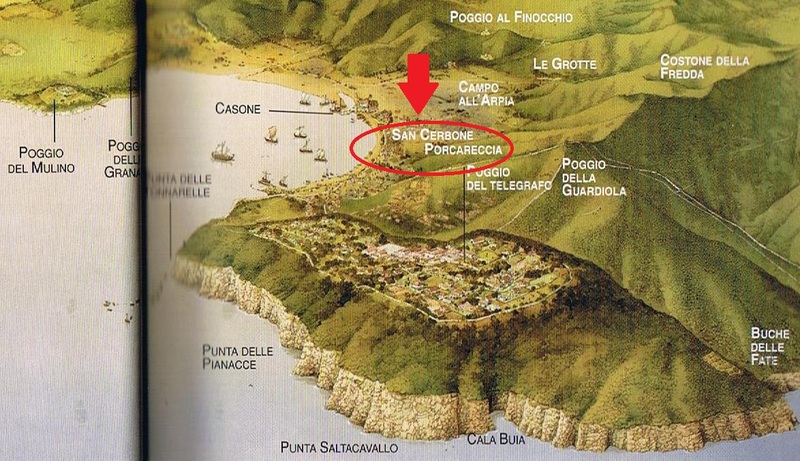 Although there is archaeological evidence dating back to the Bronze Age, our mission was to further investigate the iron ore smelting and production that occured between the 9th century BC and the first or second century AD (estimated) in the area known as San Cerbone off the Gulf of Baratti. Professor Carolina Meagale from the University of Florence was contacted by the Superintendent of Archaeology about starting a new excavation directly across from the Necropolis (tomb area) that was excavated back in 1957. 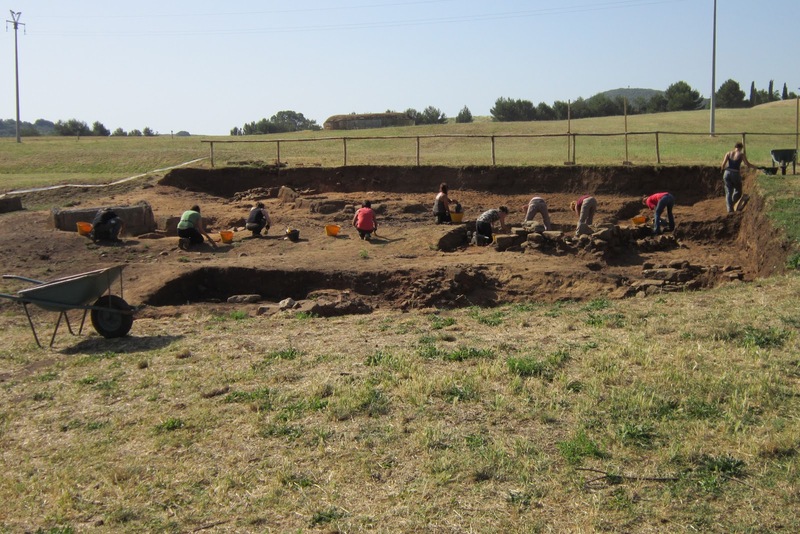 This site is actually located within the Archaeological Park of Baratti and Populonia so this is a very exciting opportunity for Carolina and her team! OK, here are the long-awaited images. First, some maps to give you an idea of where we worked. Although I frequently refer to the present-day town of Populonia as the "Hooterville of Italy", the nearby seaport of Piombino is quite lovely. This entire area was occupied by the Etruscans and if you see the little town at the very left of the ancient map, you will see "Poggio del Mulino" (aka "the Villa") which is the dig site where we worked last year. 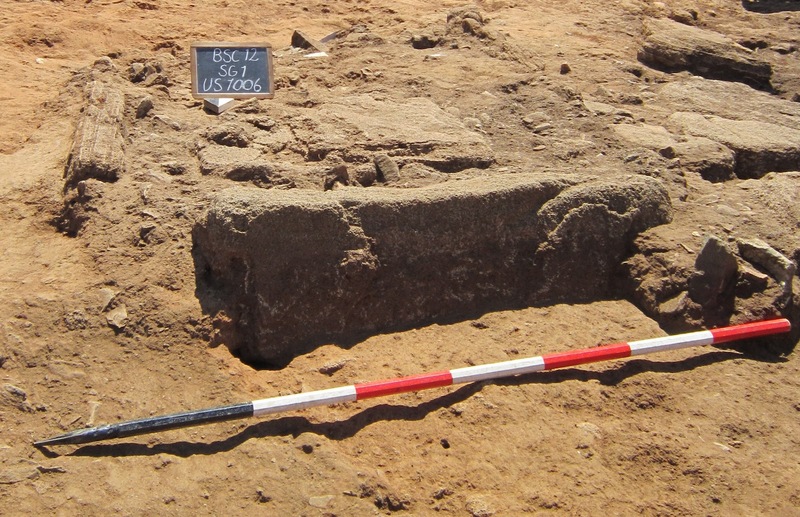 At San Cerbone, a new cut was made approximately 30 feet to the west of the Necropolis that was previously excavated in 1957. Our site is to the right of that "caution" tape that runs along the right side. 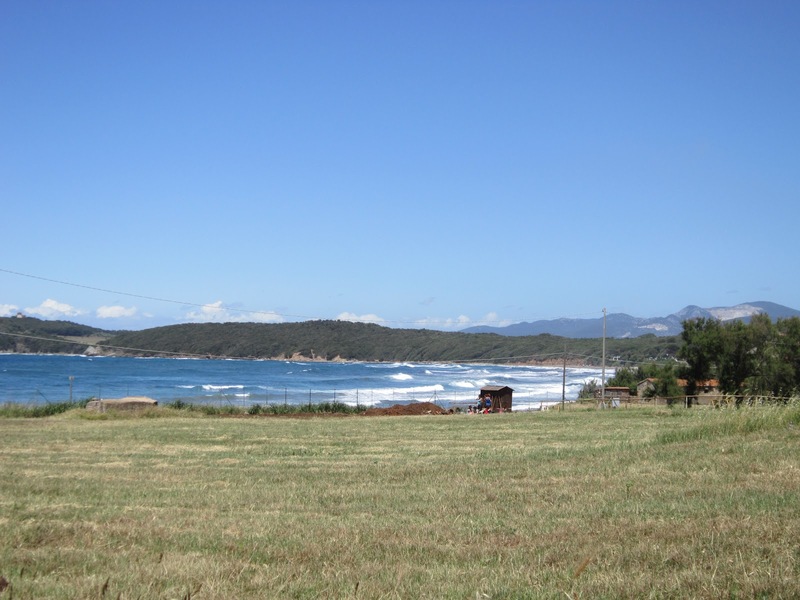 Both sites are right next to the road the runs along the beach. That little shed is where we kept most of our equipment. 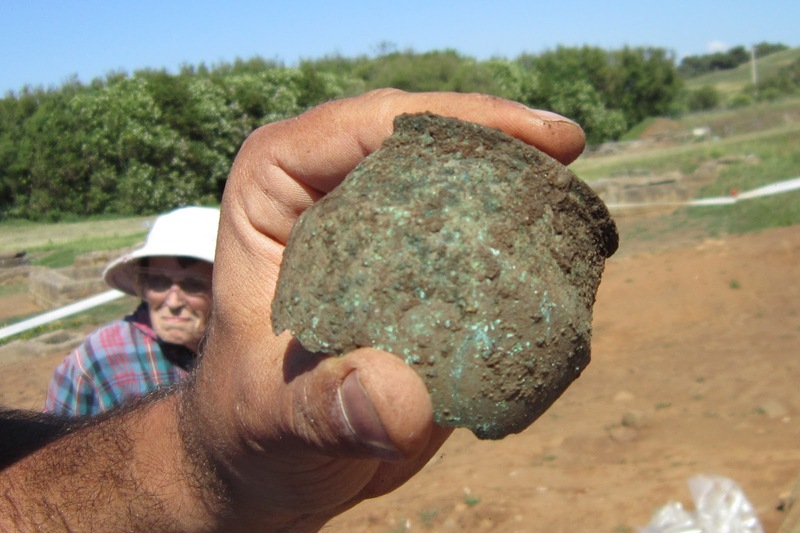 And a glass bead that did not photograph well. (sorry!) 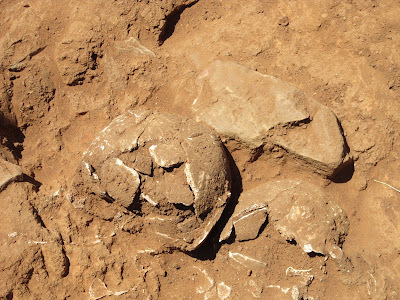 This site was extremely unusual because we uncovered artifacts every single day. 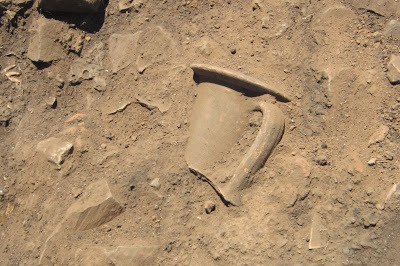 We expect to find grave goods when tombs are present but I was surprised at all the pottery uncovered and it took us several days to wash and tag it all. By the way, I find washing and tagging pottery to be very dull. I would rather slave in the hot sun than sit under a tree and wash pottery. So everyone starts at the top and works backward with a bucket and a small whisk broom. It's crazy. 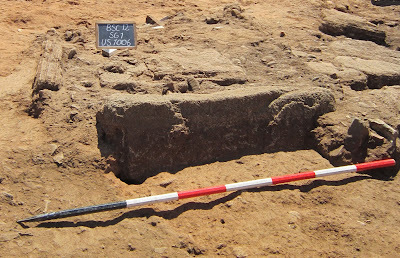 I argued for a big broom but apparently using a household size broom is not considered GAAP (generally accepted archaeological practice). Yeah, I made that joke on site and no one laughed then either. So if you take a look at the "cleaned" site above, you can see the tomb in the upper left hand corner. Moving downward and to the right is the black/grey layer with all the pottery. Moving further to the right is a wall and further down is the area where we believe the iron ore was produced. The ground against that outer right wall is VERY hard and this is where I sliced my finger open, which is healing quite nicely now. In fact, I doubt you will even be able to see the scar. 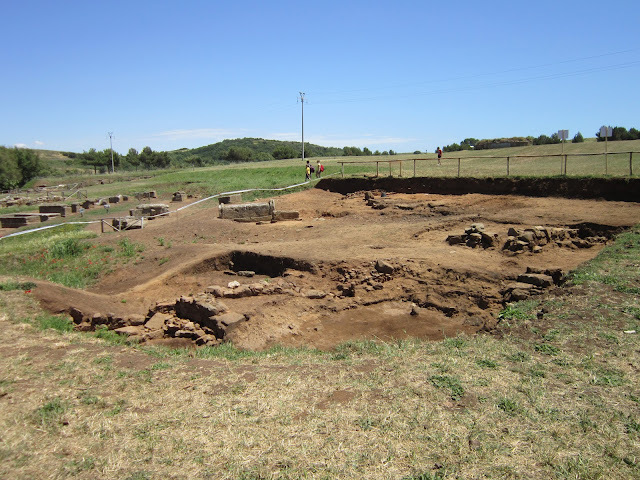 Overall, we are very puzzled by this site and looking forward to working there again soon. In the fall, Carolina and her team will go back to the Villa to work for six weeks and won't return to this site at San Cerbone until next May. 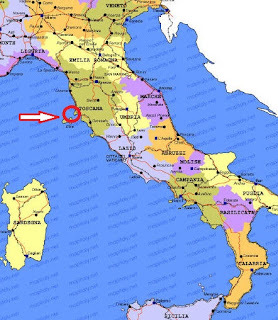 I will be there - for the entire six weeks next year. 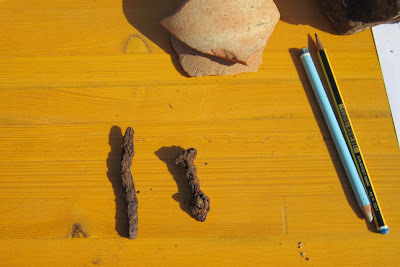 So I hope you enjoyed this blog. 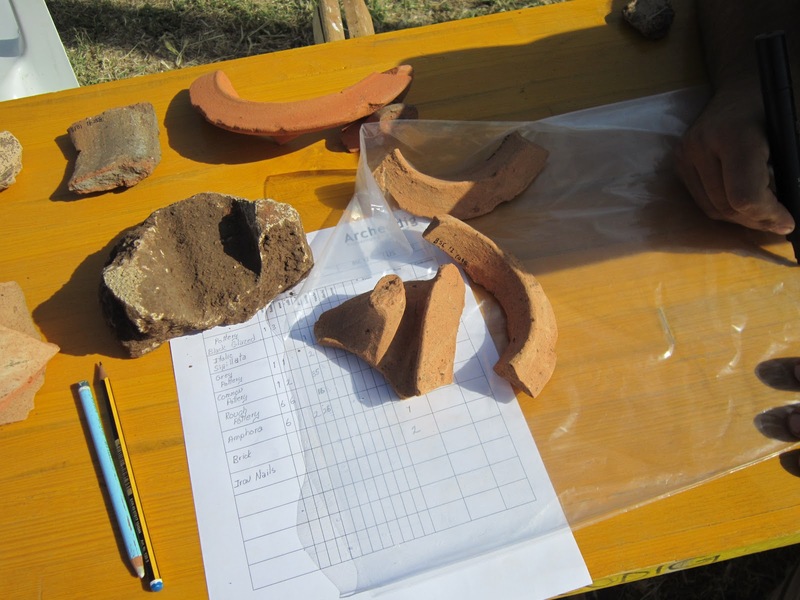 For those of you who pledged donations to the Archaeology Center at Columbia, I can't tell you how much we appreciate your support. Archaeological endeavors are plagued by shortfalls and it's very difficult to find funds to finance projects, equipment, and research. I want to thank you again for your most gracious and generous contribution. Every little bit helps. Meanwhile, if you have any questions about the site or anything else, please feel free to email me or post questions here. I will be starting the Masters Program at Columbia in September, so the journey will continue . . . I laughed at your GAAP joke. Great post. Thanks for sharing all this, especially the wonderful photos.